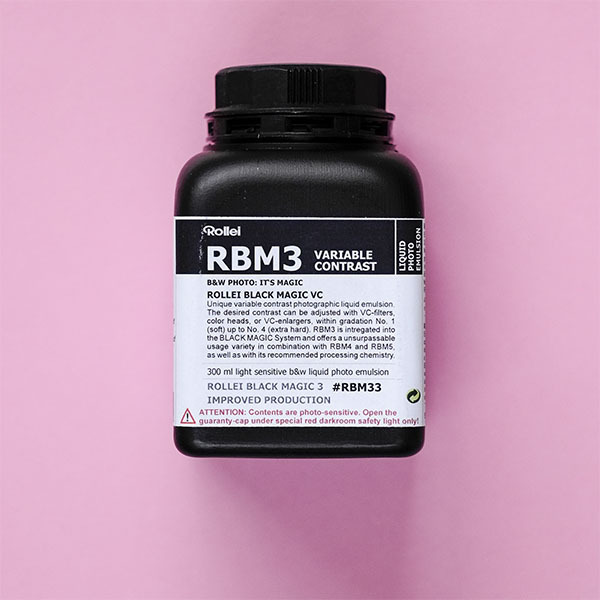 Rollei Black Magic VC Photo Emulsion is a variable contrast photographic emulsion. You can coat it on a wide variety of surfaces to create photographic prints. To start off with we would try Rollei Black Magic on various fine art papers. This will give you the freedom to create photographic images with paper textures not normally found in standard print papers. Alongside paper, you can apply photographic emulsion virtually any surface imaginable. Of course, you could try a number of surfaces: wood, glass, metal, fabric, and plastic. Whenever the surface is either very porous or smooth we would recommend a coat of Rollei Black Magic Gelatine. You apply a coat of this before you coat with the emulsion. It is worth a read of the Rollei Black Magic Photo Emulsion instruction sheet before you start the process. This will give you some idea of what you need to prepare. Also, we would always recommend some test prints. Especially before you start a big project.